ANDOVER – Would you like to be part of this year’s Relay for Life at Pymatuning Valley? (From April 12 edition). According to Andrea Wonderling, the PV Cheerleading Boosters is currently registering and accepting team members for its 2019 team as scheduled during the day for Thursday, May 2, at PV HS football field track area in Andover. In order to be part of a team, participants are asked to join a team, fill out a form and spend time collecting donations. 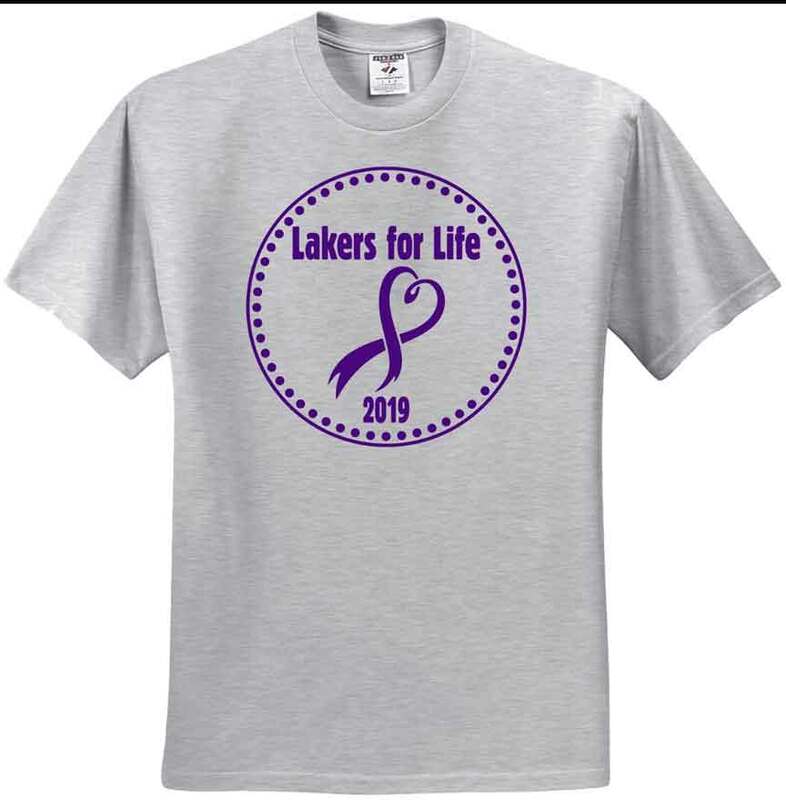 They may purchase a Mini Relay for Life luminary in order to honor or remember someone affected by cancer, can buy a t-shirt in support of their Lakers for Life Relay team to wear on May 2, as well as should be prepared to donate that day as well. This year’s Mini Relay for Life shirts are gray with purple and black printing with a front and back design, are $10 for youth small through adult extra-large or $12 for 2X and 3X. Orders are payable to PV Cheerleading Boosters and are due Tuesday, April 16. This year’s goal is to raise $3,000 and all money that is raised at the event will be donated to the American Cancer Society 2019 Relay for Life in Ashtabula County. You can also register at www.relayforlife.org/ashtabula under the team Lakers for Life. Pictured: A view of the front of this year’s Relay for Life shirt, which is $10 for youth small through adult extra-large and $12 for 2X and 3X. This year’s event is set for Thursday, May 2, within the PV HS football field track area during the school day.